Here's a recipe for all the birthday celebrants this month. Whether it's your 7th or 37th birthday, everyone will enjoy this Chicken Alfredo Pasta. Perfect for birthday parties! 1. 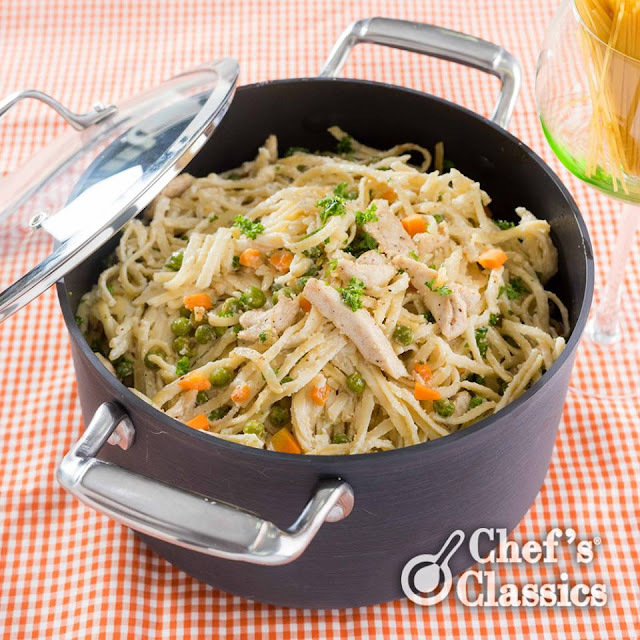 Cook the pasta in Chef's Classics Hawthorne Casserole with salt until al Dente or half-cooked. Set aside. 2. Saute white onions with the butter then add chicken. 3. Using low to medium heat, add-in cream, salt and some white pepper after the chicken is brown. Stir occasionally. 4. Add cheese and the pasta. 5. Toss the pasta and the sauce until the sauce thickens. 7. Serve individually or in a large family platter. You can also serve with bread.